We are Tim and Misty at ChunkiChilli and this is our own exclusive range of organic cotton puppets and soft toys. 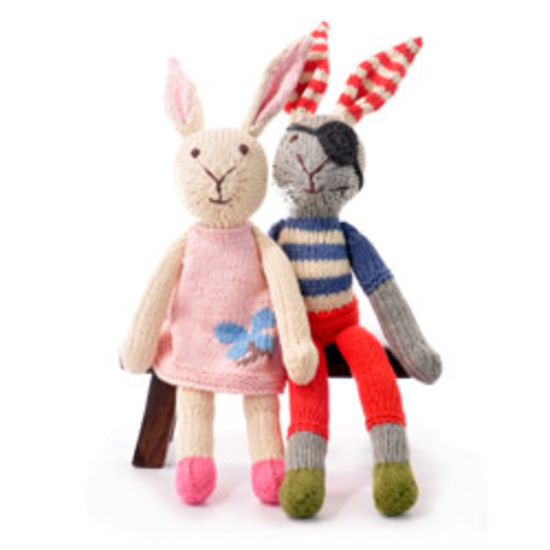 All of the toys and puppets are hand knitted in certified organic cotton and padded with Oeko-Tex certified stuffing. We designed these toys ourselves, intending them as a special gift that speaks volumes and spans the generations. Children love them, but we also know quite a few adults who collect them avidly. ChunkiChilli has been in existence for nearly a decade already. We have always liked vivid colours, and then we discovered colourful organics in a big way after our own children were born. Toys inevitably find their way into small children's mouths. We could never be sure what was in the toys we were giving to our children, so we decided to produce a range of toys that we knew for sure would do them no harm. The range includes elephants, rabbits, monkeys, pigs, lions, tigers, mice and pandas, all bursting with character. The designs fit loosely with the theme of a trip to the seaside. You'll find pirates, hula hula dancers, and some rather elegant lady rabbits. Items ordered before midday on Wednesday 21st December will arrive in time for Christmas. Items ordered by express delivery before midday on Thursday 22nd December will arrive in time for Christmas.